All products sold by Nomination are covered by the 24 (twenty-four) month legal guarantee against defects in conformity, according to Title III of the legislative decree 206/2005. The legal guarantee against conformity defects is only valid when the product is used correctly and as per its intended use, according to the usage and care instructions provided along with said product. In order to utilise the guarantee, it’s necessary to provide the receipt indicating the product’s purchase date, to wit the warranty certificate, validated with the stamp and signature of our authorised retailer in the case of a purchase made at a retail store. If there is a defect in conformity, the Client has the right to request the repair or substitution of the product. If such a repair or replacement isn’t possible or is excessively costly, the Client has the right to a price reduction or to the dissolution of the contract of sales, according to art. 130 of the Consumer Code. Once Nomination has received and verified the product under warranty, Nomination will proceed with said product’s repair or substitution as soon as possible, except when not possible or in the case of excessive costs, as per art. 130 of the Consumer Code. Every potential judicial motion for conformity defects must be submitted within 26 (twenty-six) months from the date the product was received. Jewellery purchased through Nomination’s official online store is accompanied with a warranty certificate according to the terms outlined above. 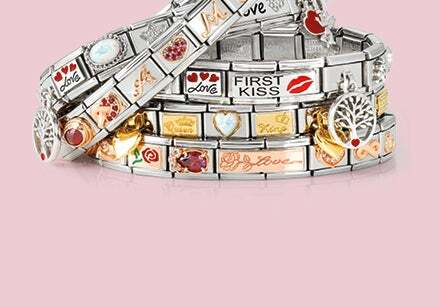 If an entire Composable (modular) bracelet is purchased, there is one warranty and it covers all of the individual parts which make up the bracelet. The manufacturer’s guarantee does not cover rhodium-plated, gold-plated or PVD coated items, nor does it cover accidental gemstone breakage. Loss of colour due to improper use and/or items produced in coloured leather is not considered a manufacturing defect. The mechanism and/or springs of the COMPOSABLE bracelet are excluded from the warranty in the case where items and/or components not sourced/produced by Nomination have been assembled or attached to the COMPOSABLE bracelet. 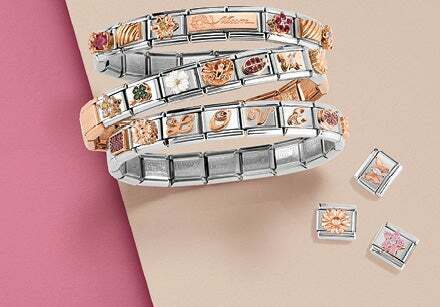 Original Nomination COMPOSABLE jewellery is easily identified because each piece contains the Nomination logo and is therefore distinguishable from articles and/or components of different origin. Nomination jewellery is crafted in certified AISI 304/316L stainless steel in combination with sterling silver and/or with 18K or 9K gold and may be treated with a galvanic bath of rose gold, yellow gold, rhodium and oxide, or with a PVD coating using hypoallergenic materials. Nomination collections in silver are crafted in sterling silver; they may be combined with natural, synthetic, and/or artificial stones and may undergo an oxidation process and/or a galvanic bath of rose gold, yellow gold, or rhodium. Nomination jewellery may also contain enamels; natural, synthetic and/or artificial stones; leather, copper, brass, rubber, silicone, cotton. The materials used for Nomination products are in compliance with Regulation (CE) N. 1907/2006 and with Regulation (UE) N. 494/2011. The precious metal par excellence, its timeless appeal and high market value make gold as irresistible as ever. Nomination uses 18k yellow gold and 9K rose gold. Nomination uses only the finest quality hypoallergenic sterling silver treated with various finishes. Rhodium is used to prevent tarnishing and maintain shine, specific collections are oxidised to achieve a vintage effect and others are made more precious with gold plating: 24K yellow gold plating and rose gold plating with a 24K yellow gold base,and 22K rose gold plating. Nomination uses only genuine Italian leather. Natural leather requires special care in order to preserve its original colour, finish and softness so leather jewellery should be removed before washing and contact with water, creams/oils and perfumes should be avoided at all times. Coloured leather may fade if exposed to direct sunlight for long periods. Leather has a natural elasticity so you may find that your bracelet may seem a little larger after you have been wearing it for a while. As part of our selection process to use only the highest quality materials, to this end Nomination also uses brass, which is available with 18K rose gold and/or rhodium finishing. In certain specific collections brass is used with 999 silver finishing and with vintage or aging finishings. To avoid damaging gemstones and scatching your jewellery store them in a jewellery box with separate compartments or in soft pouches. Remember to remove your jewellery before applying perfumes, skin creams, suntan lotion or oils of any kind. Never wear your jewellery when working with detergents, bleaches, ammonia or alcohols; these chemicals will cause discoloration, damage and loosen stone settings. To clean sterling silver or gold plated jewellery use a dry soft clean cloth to wipe them clean. Do not use brushes of any kind as these may scratch your jewellery. To clean stainless steel jewellery use warm soapy water and a soft toothbrush.